Moist, delicious and always a favorite! - Ground your Oats to a powder. 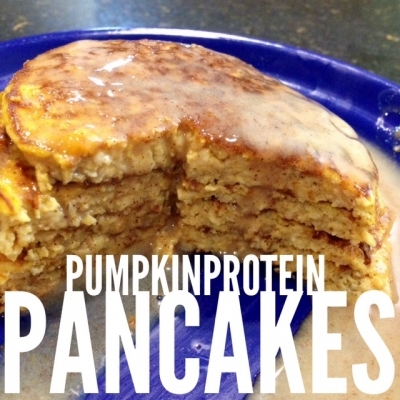 - Combine Oats, Pumpkin, Egg Whites, Almond Milk, Spice and 3/4 scoop protein into a bowl & mix well. - Spray your pan with Pam and cook your pancakes on medium heat, flipping once. - Combine remaining 1/4 scoop of protein with your syrup. - Add a splash of Almond Milk to keep syrup consistency. - Add another pinch of spices if desired!